This recipe is for Stacey! We were having dinner together last night, and we all realized what a gift it is to be able to just sit together, drink a glass of wine and talk. Sometimes we just get so caught up in the hectic-ness of life that we forget to take a minute to just stop and enjoy each other. 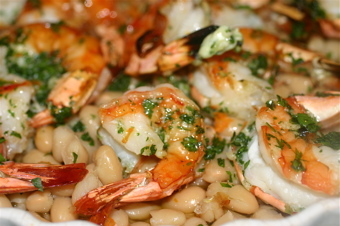 So here is a simple recipe for Shrimp with White Beans, one of the world’s great combinations. You can make it in the time it takes to drink a glass of Proseco! You can use dried white beans, but you will need to soak them overnight and then simmer them until soft, about 4 hours. It is also quite acceptable to use canned beans. Drain the canned beans, and reheat them in some chicken stock or salted water. Place the garlic and parsley in the food processor and pulse until they are finely chopped, then start adding the butter in small pieces. Process until everything is nicely incorporated, green tinted, and garlic scented. Here is the only tricky part: Remove part of the shrimp shell. Lay the shrimp flat on a cutting board, and cut lengthwise along the back shell (not the feet side! ), carefully removing the top half of the shell, but keeping the tail intact. Once you have done that, place a small amount of butter mixture on the underside of the shell, and then replace the shrimp on top of the shell. You are lining the shell with the butter mixture. Broil the shrimp until done…1 to 2 minutes. Strain the beans and place on a platter. Arrange the broiled shrimp on top of the beans, pouring any cooking liquid onto the beans. Sprinkle with some chopped parsley, and some orange peel zest. Great with an assertive white wine, or a young, mellow red wine.